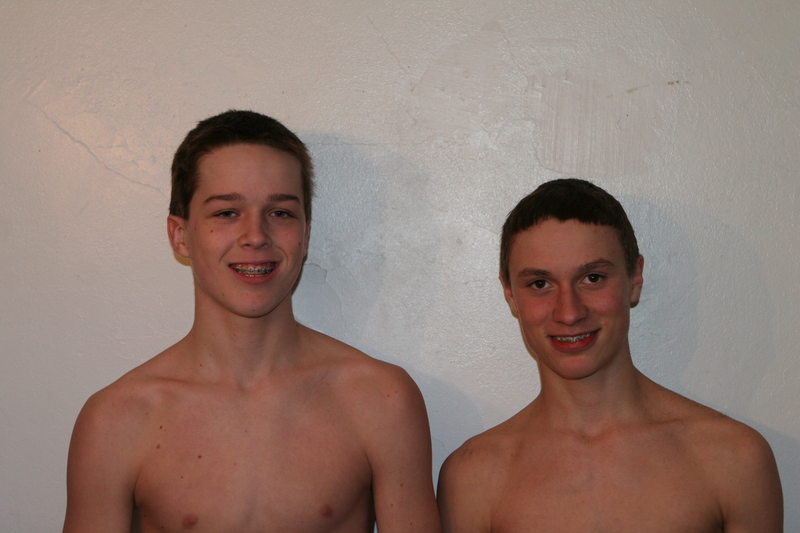 About a week before we headed north for the Vermont State hockey championships Nathaniel and his best friend Max decided to get a “tournament cut.” Rebecca was of course game with her electric shears and before we knew it the boys were strutting around with their shirts off and feeling pretty good about their shearing. There ain’t no words for the beauty, the splendor, the wonder of, in this case, little hair. On Friday the boys headed up to Highgate Center, a wrist shot from the Canadian border, and handily won their first game of the Bantam tournament. 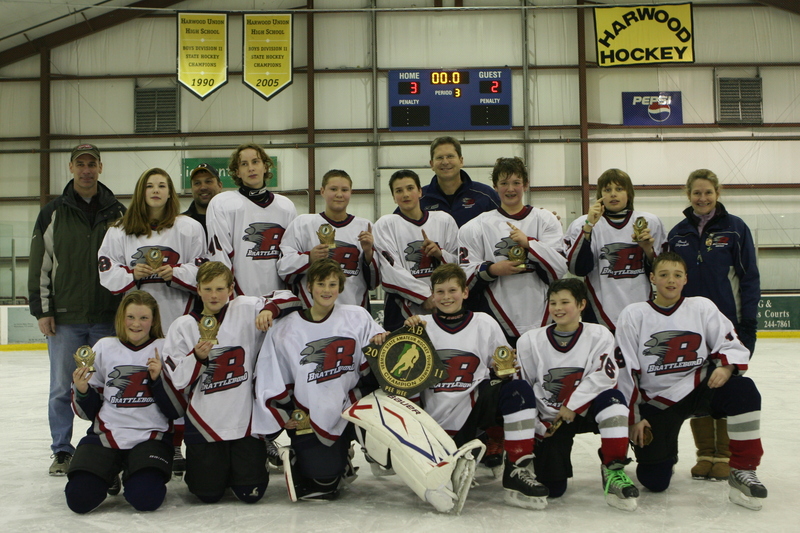 Ellinore’s Pee Wee team also started the tournament well with a win at the Harwood Ice Center in Waterbury. We spent the weekend in Burlington, Vermont. Nan’s team drove North and E’s team drove south and we gathered in the evening at the hotel. 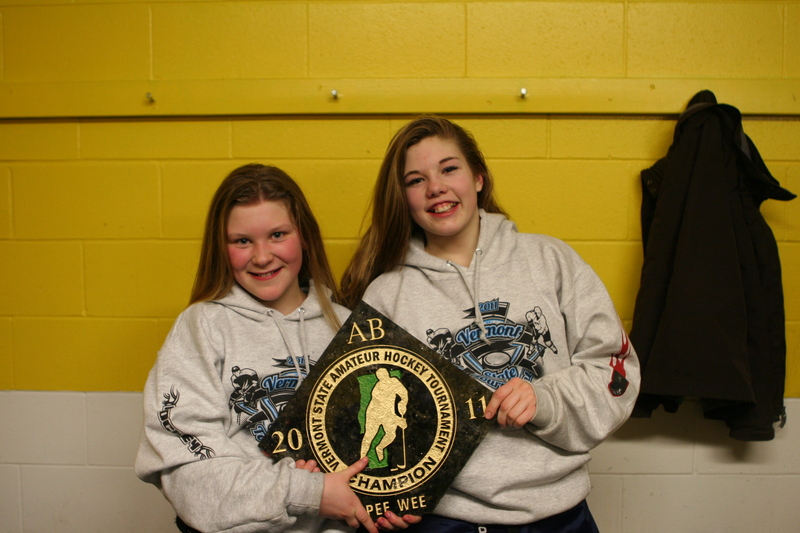 The Bantam’s lost their second game—one of those games they should have won—and Ellinore’s team stayed in the winner’s bracket with a second win. Saturday night was all about hair. 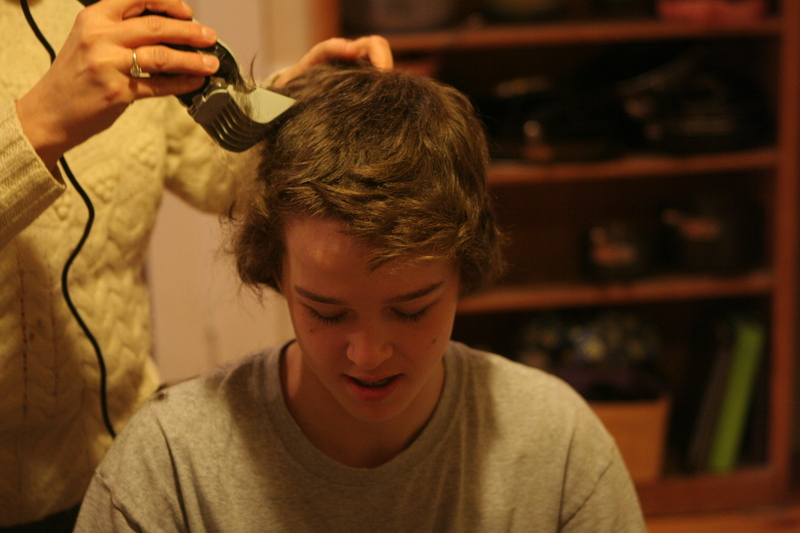 Rebecca anticipated that the “tournament cut” would catch on and, indeed, there we were in the Burlington Best Western hotel with fourteen sweaty boys in our bathroom and Rebecca shearing their heads like it was the first day of boot camp. One by one the boys emerged from the bathroom looking, well, clean cut—even handsome. There were two holdouts, though. But in the end, the majority of the team looked like a bunch of new recruits. Unfortunately, the Sunday morning game was less sharp and the Bantams, though playing well, could not overcome a better game by St. Albans. 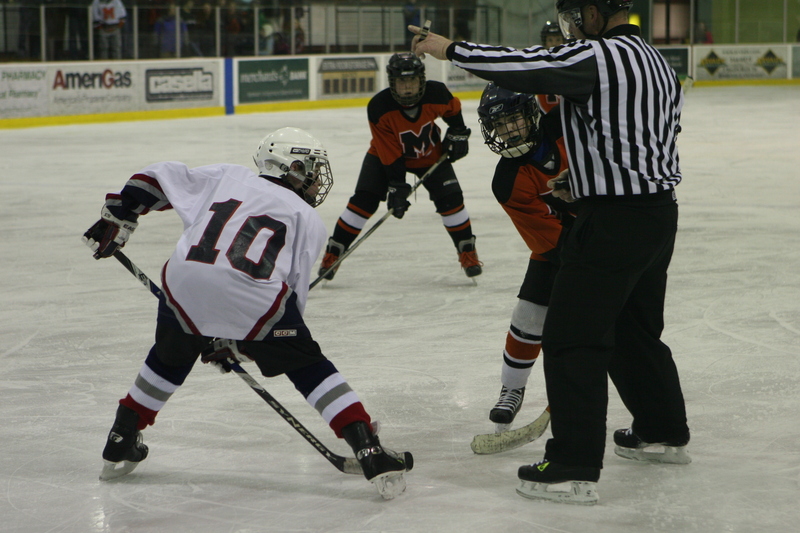 The teams were very well matched and we could have gone deep into the tournament had the puck bounced our way. But it didn’t. And that’s hockey. But down south in Waterbury the team with the girl with a thick blond pony tail, shoulder length or longer, fared better. 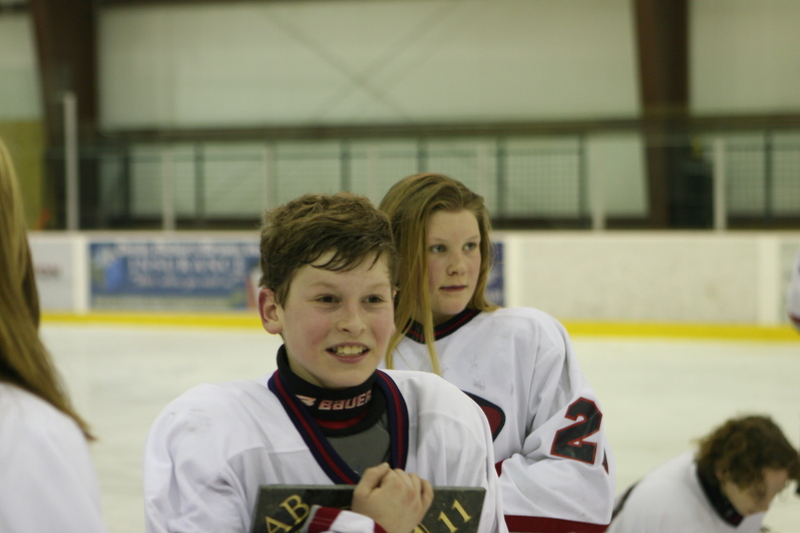 Sunday morning the Pee Wee team found themselves on the ice against a big and ready if not rough St. Albans team. We had a two goal lead deep into the third period when they pulled the goalie and scored. The team managed to hold them off for a 3-2 win. Later Sunday afternoon we played our second game of the day, the fourth of the weekend, against the team the girl with a thick blond pony tail, shoulder length or longer’s team had defeated in triple overtime three years ago for the State Tournament. The game was back and forth for three periods but we managed to pull off an undefeated weekend of play with a 2-1 win. And so the girl with a thick blond pony tail and her team hit the ice against a Middlebury team on a roll. The team on the roll scored first. But then after a few shaky minutes the Brattleboro team scored not once, but twice, to take a 2-1 lead into the second period. It was a back and forth game, though, and Middlebury tied the game in the second period and we headed into the locker room tied 2-2 as the Zamboni did the ice between the second and third periods. A third and final period with the game tied with a state title on the line is worth having. And the girl with a thick blond pony tail and her team rose to the occasion, netting a goal with six minutes left on the clock. Each team then had many opportunities to score as the clock slowly went on its way. In the end, happily, it was the Brattleboro Hawks 3-2 for the state championship. 2011 Pee Wee State Champions! The girl with a thick blond pony tail (shining streaming gleaming flaxen waxen) was stellar in the final minutes. She made crucial stops on a number of odd man rushes and made smart decisions clearing the zone as the Middlebury team pulled out all the stops (including pulling their goalie in the final minute). Later the coach of the girl with the thick blond pony tail commented that she was the best defensive player on the ice all week. The girl with a thick blond pony tail, shoulder length or longer, and her short-haired teenage brother, have more ice time in the coming weeks. (Here baby there mama. Everywhere daddy daddy. . . .) Tomorrow she plays a select team from Massachusetts and he will face off against a team from New Hampshire Sunday and the Eaglebrook school varsity B team Tuesday night. Then we begin a few weeks of tournament play in the Greater Springfield league. And the girl with a thick blond pony tail will be joining her team at the New England Sectional playoffs in Lewiston, Maine. By April Fool’s day, with any luck, we should be letting down our hair.